The Panasonic ES-LV95-S Arc5 is Panasonic’s flagship product. It can easily outperform whatever mid-range electric shavers you are using now. With really impressive features and sturdy design you will definitely trade in your old shaver and never look back after you read this ES-LV95-S Review. 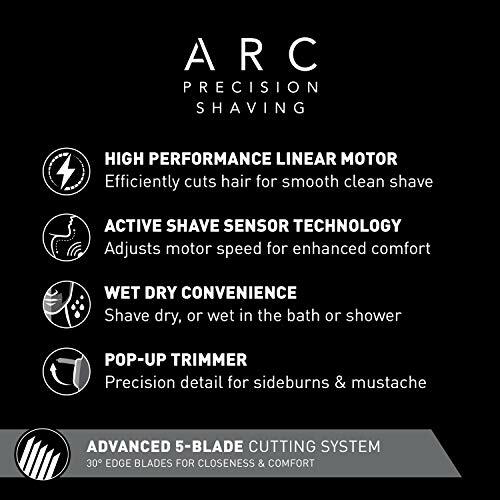 So, let's look at the most important buying factors you should know about if you are looking to purchase the Arc5 ES-LV95-S. In its ES-LV95 model Panasonic has added a new feature that detects facial hair density. It automatically increases power when it detects dense areas and decreases power for areas with less facial hair. The system prevents unnecessary irritation and heat-build up on the foil. Enabled with a multi-flex pivoting head it is very easy to cater to those sensitive contours of your face like the chin or neck area easily. The shaving head of ES-LV95 will effortlessly move around your face, and minimize any sort of redness or irritation. Note: this is one of the main differences from the Panasonic ES-LV81-K model where it's head does not pivot. 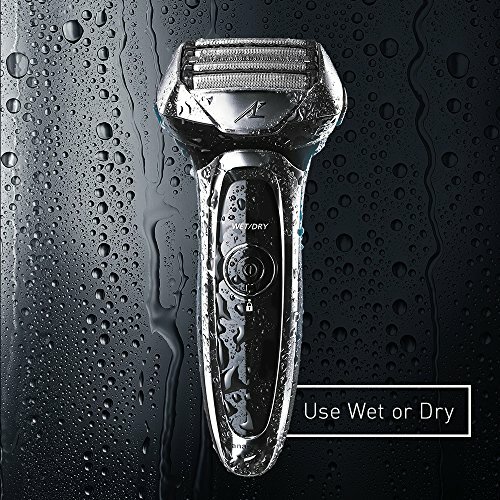 Whatever you like, wet or dry, the ES-LV95 allows you to shave with cream and even without cream. 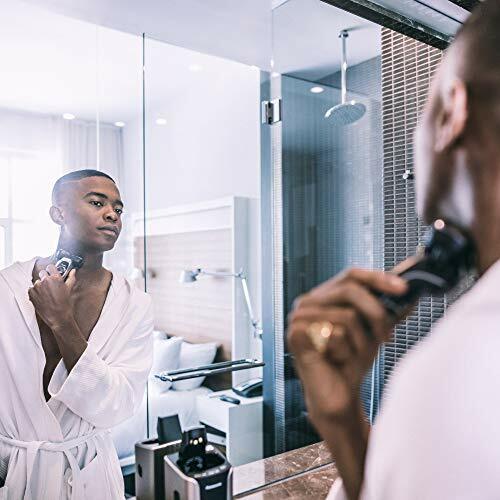 To keep the razor up to the mark at all times, the premium automatic cleaning station deep cleans and washes excess hair and gunk while charging it at the same time. A step ahead of the first generation cleaning stations, instead of cassettes this one uses a detergent solution mixed with water. Even if you don’t want to use the cleaning unit 1 day, you can manually clean it under running water. A ten stage LCD panel at the front indicating both battery life and an indication to let you know when to clean your razor. It also has an indication for whether your safety lock is on or not. Note: You can read my Panasonic Arc 5 comparison if you want to view all the models side by side. This is the very first electric razor in the market with 5 shaving blades. These are 5 highly precise, ultra-sharp, hypoallergenic nanotech blades set at 30 degrees take care of all the heavy lifting. Inclusion of 5 blades is not unnecessary, rather the whole system works really well giving you that perfect look. A linear motor that delivers 14,000 cuts per minute and with its 5 blades you get 70,000 cross-cutting actions per minute. If you have a tough beard and you need to cut if fast, well nothing will work better than this razor. 3-micro thin foils built on its head. The Lift-Tech foil will gently raise and cut those irksome hairs that lie flat on your face. The Slit-Blade foil holds and cuts those longer hair growing in all different directions and the Finishing Foil makes the final pass and snips off those extra-thick hairs that other two foils may have missed. In most of the electric razor you find in the market the head of the razor is one single unit. But the Panasonic ES-LV95-S, the head is not one single piece. The foil and blade components are separate hence you can replace them separately. 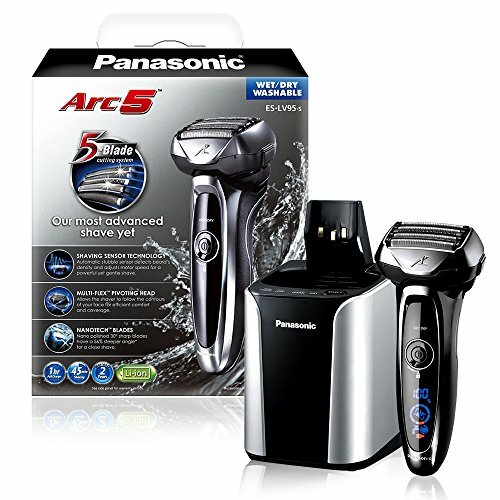 This is definitely Panasonics best electric shaver model when you compare all the arc 5s they offer. Made in Japan, this razor has high grade plastic with silvery chrome finish. The ergonomic palm and thumb grips etched in the back of the device give you a very nice hold. Closeness is something where this razor shines above all. If you are among those who shave once in 2 or 3 days, then this is the best razor you can have. Its 5-blade system is really efficient in taking care of multi-day beards. With premium shavers you are obviously looking at something more than just closer shaves. The features of this Panasonic ES-LV95-S Arc5 are really flawless. With an improved cleaning station, a comprehensive LCD screen and a sleek chrome design it is really one of the best options you can look for.